These gorgeous embellishments are so easy to make and this Organza Flower Tutorial will show you the steps you need to take to make beautiful blooms for your cards. Adding flowers to your cards can cost a small fortune...but if you learn the art of making your own you can save yourself lots of money. On the website you will find all varieties of flowers for you to create, from Spring Blooms to Poinsettia flowers that can adorn your Christmas Cards. Now here is the delicate and lovely Organza flower that is sure to please you and your recipient. 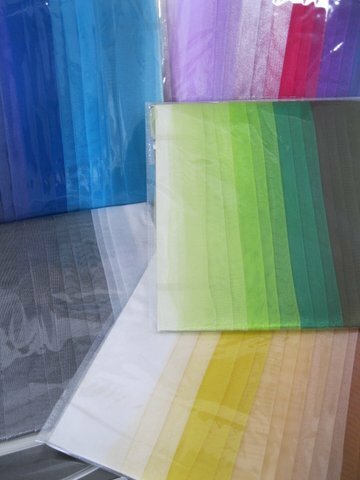 I bought these packs of organza very cheaply from the "Pound Shop" and from the 20 sheets, using three layers to each one, I can make a good few flowers, and the packs come in different colourways. You can add as many layers as you would like and the more you add the more full the bloom. But generally I find three to be sufficient. If you don't have a way to make the circles then make the blooms from squares and just cut the sheets with scissors. Once the fabric is heated and shriveled the effect is much the same. Make lots and store them to keep them clean and then you will always have some on hand to add to those special cards. Ring the changes by adding different embellishments to finish them off. I hope you will try this easy technique, but please be careful with the heat gun. Most of these tools come with a little silver wire on the end and this is to enable you to stand it to one side so that the hot tip doesn't touch your work surface.